Improved education can only be derived from improved teacher training instruction. Time To Know provides the best and most cost-effective way of achieving this. Time To Know, a leading provider in digital teaching platforms and integrated classroom solutions, today announced an alliance with KNUE to integrate Time To Know’s powerful content generation and digital teaching platform technology into the university’s teacher training program, which trains and certifies the majority of South Korean primary and secondary teachers. One of the largest universities in South Korea, KNUE was recently appointed by the South Korean Ministry of Education to take a leading role in revitalizing public schools through the implementation of digital education. 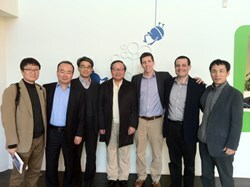 According to Professor Kim, “I see a lot of potential in using Time To Know’s innovative digital teaching technology to expand the teacher training program at KNUE, with its advanced pedagogical models, to address the larger issue of revitalizing the teaching methodologies in South Korea’s public schools for the twenty-first century. The agenda for the delegation included visited a school to see Time To Know’s Digital Teaching Platform in action, demonstrating the next generation Content Generation Studio and Digital Teaching Digital Teaching Platform solutions, and discussing ways about how to working together. Time To Know is a leading provider in digital teaching platforms and integrated classroom solutions that started in 2006 with the aim of transforming traditional classrooms into smart, digital centers of learning and to ensure that students are truly equipped with 21st century skills. The company promotes solutions designed to empower teachers and students in the digital age. Today, over 200 schools around the world are currently working with Time To Know. The company partners with leading publishers in the global K–12 marketplace, such as McGraw-Hill Education in the United States and Doosan Dong-A in South Korea, to provide local core curriculum. For more information, visit http://www.timetoknow.com.